I suppose I've been on something of a bathroom kick recently. After putting the finishing touches on my master bath last month, I painted my upstairs' guest bath turquoise last week. Next up on my bathroom "to decorate" list is the powder room. 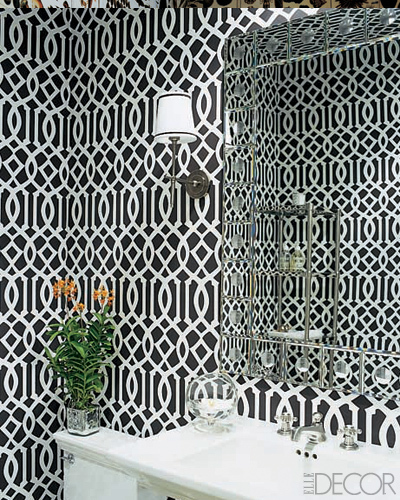 What I love about decorating powder rooms is how you can really go all out. Since powder rooms are separated and closed off from the rest of your house, you don't have to worry too much about matching it to the rest of your decor or simply getting sick of it (after all, how much time do you really spend in your powder room?). 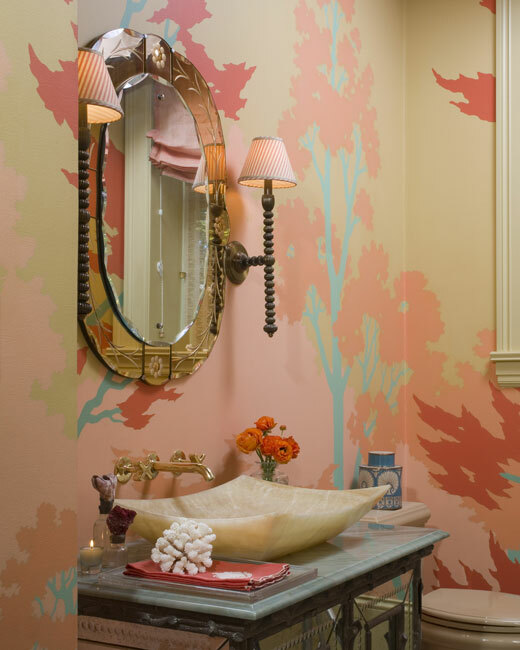 Unencumbered by any sort of obligation to make it work with the rest of your home, a powder room is a great opportunity to try out crazy color schemes, bold patterns, etc. 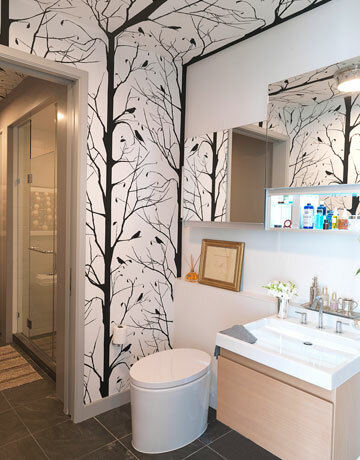 And, from a practical standpoint, a powder room's small size also equates to fewer dollars spent (particularly important if you're working with a pricier wallpaper) and an easier time redoing everything should you find yourself regretting your leap of faith. As I've been contemplating the direction I want to take my powder room over the past six months or so, I've also been saving inspiration photos of particularly inspiring bathrooms. When looking back over these shots, the one thing that's immediately apparent is that I have a thing for patterned wallpaper in powder rooms. 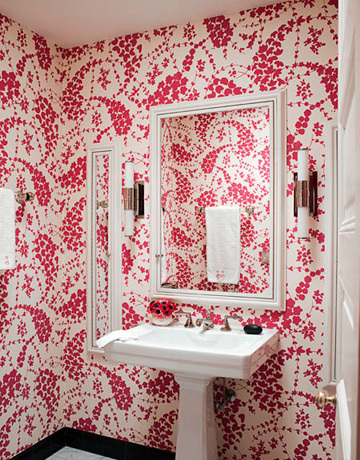 The wallpaper used in the powder room by Jonathan Berger above is Lysette in Magenta by China Seas and I love the bright pattern and how well it works with the white fixtures. The hot pink is also a great reference back to the main floor of the house, which incorporates hot pink throughout. 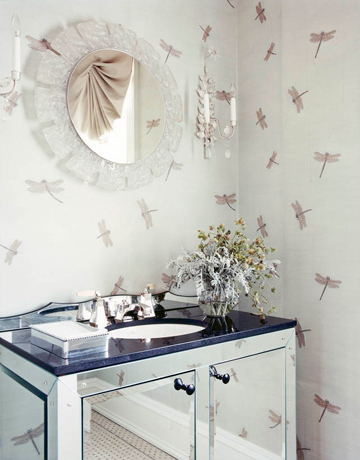 If the wallpapers play a starring role in these powder rooms, then the vanity mirrors are without question the award-winning supporting actresses and actors. 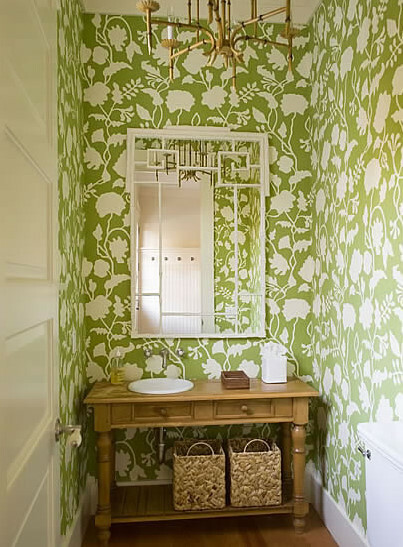 In this bathroom from Meg Braff, the organic pattern of the wallpaper (Potalla Background in Jungle Green by Alan Campbell) is nicely set-off by the geometric greek key on the mirror. Just like white woodwork against dark walls, a white mirror creates contrast and even architectural interest where there was none before. There are so many incredible mirrors available on the market today that can be hard to pick a direction but the best advice I can give you is not to limit yourself to mirrors that are expressly for bathrooms. For a roundup of my favorite mirrors, see HERE. This powder room from Joe Nahem is almost too pretty for words, but the Barbara Barry mirrored vanity shifts the mood from girly to glamorous. Describing this wallcovering as "wallpaper" is probably an insult -- it is in fact hand-painted and embroidered silk wallcovering from Fromental. A serious investment, to be sure, but it's undeniably gorgeous. Jeffers Design Group out of San Francisco is consistently one of my favorite design teams. Their work is colorful, dramatic and unique, but there's enough traditional elements to keep it from feeling completely off-the-wall -- and that's exactly how I would describe this powder room. I'm a huge fan of wall-mounted faucets, especially when the sink is deck-mounted. I also love the variety of materials used in this room -- nothing matches but it still all works together. And that, in my opinion, is the hallmark of a design professional. 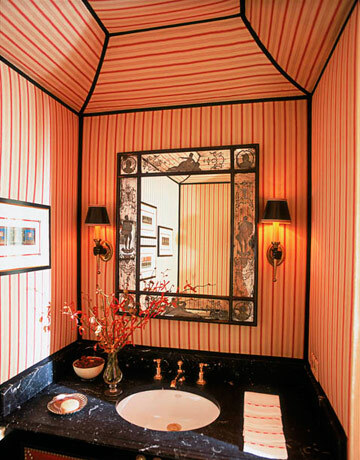 I actually have a number of powder rooms in my inspiration files that have a wonderful "tented" trompe l'oeil effect, and I love the effect in powder rooms that are particularly cramped and/or have low ceilings. Instead of trying to hide the lack of (horizontal or vertical) space, the small size is celebrated. Since my powder room is tiny and tucked underneath the stairs, I contemplated going this route myself. I love how Thom took the wallpaper (Cavern Home's Blackbird Wallpaper) and ran it all the way up and over the ceiling. Not only does it stretch the ceiling height, but it also helps enhance the fantasy-like quality of the paper. To keep the room from being overwhelmed, however, Thom left the wall behind the vanity white (also a great cost-savings measure) and kept the fixtures very sleek and modern. Designer Monique Lhuillier's home is still one of my favorite spreads in Elle Decor (see HERE). It's a gorgeous example of how a predominately neutral palette (most of the house is decorated in black, white and grays) can still be incredibly glamorous, dramatic and feminine -- and Monique's powder room is a great example of this. The custom wallpaper is a KWID Imperial Trellis look-a-like from Astek. KWID's classic print is not available in black and white, but you can find it in a tone-on-tone black as well as charcoal and white. There's something about yellow and white that just makes me happy and it's the perfect palette for a bathroom with little or no natural light. The wallpaper is by Telio, which appears to be available in Canada only. If you're looking for a similar look from a resource available in the use, try Farrow and Ball, which has a great selection of yellow wallpaper in a variety of patterns. If you'd like to see this entire home (which is just as darling as its powder room would suggest), I did a post on it last summer you can view HERE. The genius of Miles Redd is that he takes very traditional design elements -- even "granny-ish" elements -- and makes them feel young, hip and new. I absolutely love the sink/faucet in this bathroom, but of course it's Scalamadre "Zebra" wallpaper that really steals the show. Okay so I've cheated here a bit: the wallcovering here isn't actually wallpaper, it's one of my favorite fabrics ("Domino" print by Duralee), but if you're looking for a wallpaper in a similar pattern, try the Lydford Pagoda in Black on White by China Seas. I think I would have instinctively stuck with the black and white theme and gone with a white mirror in this bathroom, but I think the antique brass mirror really adds a wonderfully unexpected (and traditional) touch. So when it came time to select the wallpaper that would go in my powder room I really agonized over the decision -- which is pretty atypical for me. Normally, I select paint colors, fabrics and even furniture relatively quickly. I tend to love things on sight and if the price is right, I go for it. But wallpaper admittedly intimidates me quite a bit. After all, it's not nearly as easy to change as paint and the price can often make a quick change prohibitive anyway. Last June I ran a poll on wallpaper options. And, while I still love both patterns (and agree with the majority's choice of the Banswara pattern), I decided to go a slightly different direction, primarily because I wanted the powder room to tie in with the adjacent family room and entryway. After much internal debate and hand-wringing, I've decided to go with a classic: Summer Palace by Osborne & Little (shown above). 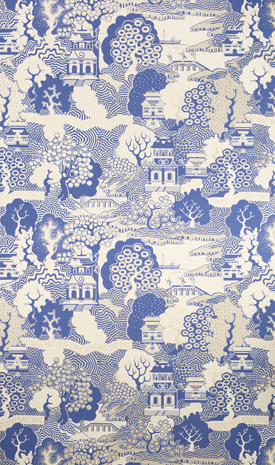 Not only is the print in my beloved blue and white, but it's in a classic chinoiserie pagoda pattern that will stand the test of time. And as for my fear of getting sick of it? Well, I had a nearly identical print (though in a more muted palette of cream and champagne) on the walls of my childhood bedroom. I figure if I still like the initial choice that I made at 16, then it should stand the test of time. I would love to swap out my existing pedestal sink (similar to the Kohler one shown above) for something a bit sleeker and more "me", but that quite simply isn't in the budget right now. Besides, it's hard to justify ripping out a brand-new sink just because I'm not in love with it, especially when there are far more pressing items on my design "to do" list. So the plan is to stick with the existing sink and hardware and spend the bulk of my budget on the two items that should make the most impact: the wallpaper and the mirror (Williams-Sonoma Home's Hampstead mirror in white, which Dave gave to me for Christmas). Since the pedestal sink is seriously short on storage space, the plan is to pick up a small storage unit like the Newbury etagere from Restoration Hardware ($259) to store necessary sundries...and to display a few pretties as well. While I'd love to invest in a few hand towels from Leontine Linens, I'm quite sure that, with hand towels starting at $90 a piece, I would never, ever allow anyone to actually wipe their hands with them. And so, in the interest of not completely freaking out my guests, I'll be picking up a few hand towels from Williams-Sonoma Home embroidered with pagodas. Even better, they're currently on sale for $18 a piece. Because all powder rooms should be gorgeously scented, I'd use one of Delirium & Co.'s Blue Period candles (shown is Delirium & Co.'s Blue Absinthe candle ($38)). Finally, for art, I'd hang Anne Harwell's Blue and White Ginger Jar print, which I picked up over the holidays but hadn't found a home for yet. I loved this post, Averill. That tented powder room is amazing! 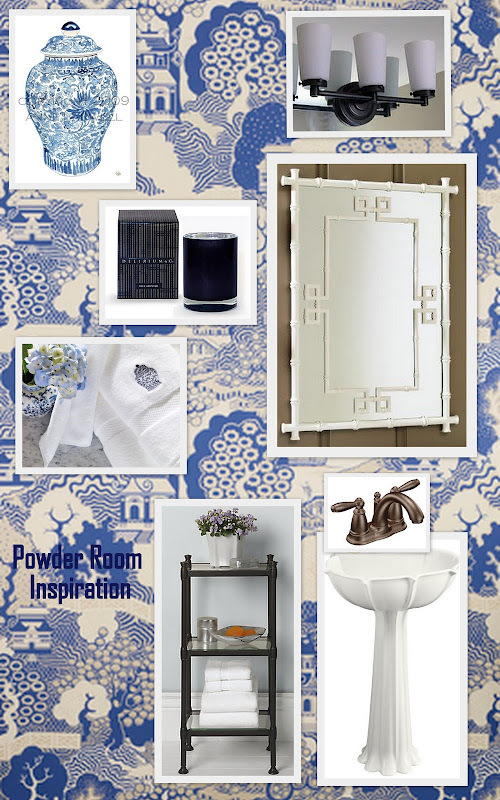 Thanks so much for including my print - I love your moodboard for your powder room. I am very, very impressed that you have so many great pictures of powder rooms - they are do difficult to photograph (because of their size), and are not often included in a magazine layout! 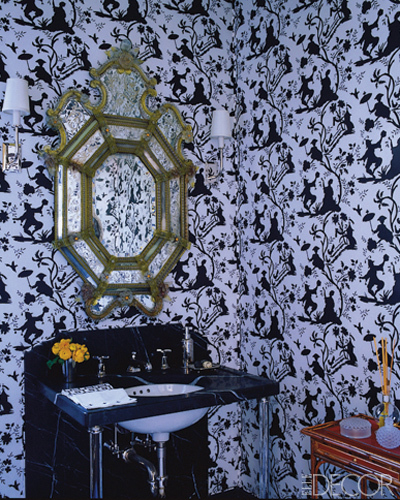 I saw a beautiful powder room recently, in a townhouse with interior by John Oetegen. It was done is silvery tealeaf paper, and was truly a little jewel box. I am going on a tour of homes for a fundraiser in late March, and one of the homes has interior by Miles Redd. I have heard that the powder room in that house is amazing. I will have to excuse myself to powder my nose so I can go see it! Love these wallpapers, especially the striped one! This is one of my favorite posts of yours yet Averill! 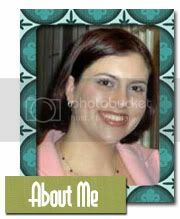 I love all the background information, and all the gorgeous inspiration photos. 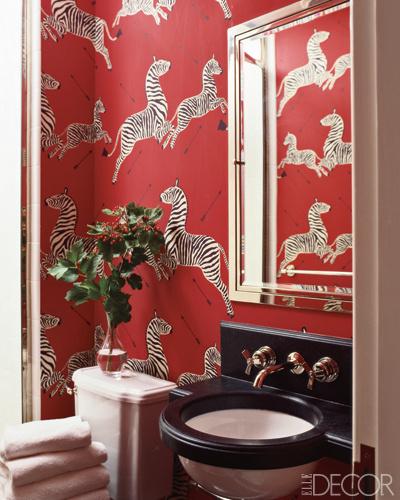 And of course, you've made me want to wallpaper my powder room (above the beadboard) with some wild and crazy print!!! I love the choice you've decided on, and can't wait to see it all pulled together. Make sure you take a before picture too! Oh wow! Your powder room is going to look great. I love that mirror! Really cool powder rooms. Can't wait to see yours finished. Went to the Berger link and loving that ikat chair! I love everything that Jeffers does. The powder room here is no exception. I love your moodboard and know your powder room will look fabulous. I cannot wait to see the finished product. BTW, I clicked back to the mirror post....thanks for the great resources. I love the one you are using. And, had to laugh about the linens comment....I'd be the same if people were wiping their hands on $90 linens! I adore patterned wallpaper in small spaces like powder baths. They make such a big statement. I really like the inspiration board for your own bathroom. The mirror is fab! I'd love to visit that pretty inspiration room - classic and lovely! Your plan coordinates so well with your living room design! I like the Chinoiserie touches. Wallpaper makes me nervous, although I like the look when done well. I'm a terrible painter, so the idea of trying to hang wallpaper is very intimidating! This is a fantastic collection of PR images. I too have mine wallpapered. It makes them feel so special. A black mirror will also look really good against the paper. Love your inspiration board...wonderful as always! As soon as I opened your post I wanted to jump right down and comment!! Were we talking yesterday? I completely agree with your take on how one can take liberties when decorating a powder bath, and you pointed out all the reasons wonderfully. I was dreaming up a design yesterday with wallpaper as the star. With such a space not requiring much product I realized styles I wouldn't be able to touch for a larger room could be considered for a powder bath. you're so right about the ability to go all out in such a tiny room. beautiful inspiration — i can't wait to see yours! I think you'd hit it out of the park - putting your idea board to reality. 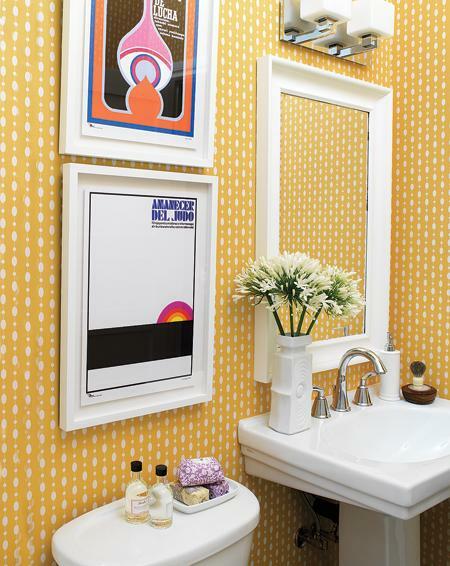 I LOVE the yellow powder room from Canadian House and Home! I have a question for you. We are moving! Yay! To a small, cute 1950s ranch style home with clean lines and a mid-century modern tone. I have always wanted a fold-up treadmill but can't stand the sight of them in a home. In your internet browsing, have you ever seen a clever way to hide exercise equipment? Or is that an impossible achievement? Wow! I can't wait to see how it turns out. You are so much braver than I am. I really like your wallpaper and the Jungle Green. So glad you decided on Summer Palace. It has become a classic and will fit perfectly in your home. I love a beautiful bath! The wallpaper is these is inspiring and I love that marble sink that is not set in the counter. Your design looks as if it will be lovely. OMG, Averill! I have been torturing myself trying to choose a wallpaper for our powder room since we moved in! I was just thinking today that I may want to go with a chinoiserie pattern but still can't decide. Will you come over and help me decide? ;) I LOVE the pattern you chose and that blue is fantastic. I think you're absolutely right - you will never tire of it. Averill -- the paper you have selected is gorgeous! It's so classic and beautiful. I'm certain you won't tire of the look of it...and I like how you are incorporating little details that will transition well throughout your entire home...and now, I'm dying to see the results! Averill, Summer Palace is a perfect choice, love it for your powder room..have fun with it! I don't think I love wallpaper any more than I do in a powder room...although my bathroom is actually so small I think it constitutes a powder room as is. Such an easy pop of wow, and you can splurge on something really nice. You have some great powder room inspiration here, but my favorite part of the post is your inspiration board. I can't wait to see the finished powder room! I love all of these! Too bad I could never pull them off. I'll just live vicariously thru you tho! Averill, my favorites are by Jeffers Design Group and then Miles Redd. So fabulous!! I just found your blog today. I'm hooked!! I love wallpaper in a powder room. It's an opportunity to make a big impact.